WJLA News Channel 8 in Washington DC (or Arlington VA, Rosslyn) continued its own (probably trademarked) “Your Voice Your Future” franchised series, produced by Scott Thuman, “The New Normal: Security vs. Freedom”. Curiously, WJLA doesn’t have the link but another station does, link here. The appropriate Twitter hashtag is “#YourVoiceYourFuture”. The biggest legislative development is a bill in the House that would strengthen visa requirements even from western countries that don’t require one now (as for those with existing residency permits). Ashton Carter took back President Obama’s previous claim that “ISIS is contained”. US Senator Tim Kaine (D-VA) and Congressman Scott Perry (R-VA) spoke about the lack of information overseas to properly vet persons coming to the US (including those seeking asylum). The Iman Johari Andul-Malik spoke for the assimilated Muslim community in the US. Amanda Berman spoke for the Lawfare Project. One issue seriously considered was that there is no “due process” for placing people on the No Fly list (which Obama wants to extend as a list to prohibit weapons purchase). People are put on the list because they have the same name as a real terrorist, and it is very difficult to get off the list once on, or even to get an explanation as to why. Tremendous personal sacrifice can come to some persons because of this problem. The American Civil Liberties Union has a page on what to do if on a TSA No-Fly list, here. As the ACLU notes, the procedure is slow and not too reassuring. You do have a 14th-Amendment right to return home. Recently News Channel 8’s “Your Voice Your Future TownHall” series has not invited an audience as in the past. Let’s hope there are more forums with audiences. Picture: Tyson's, from the Silver Line Metro. The National Counterterrorism Center (which works closely with the NSA) is somewhere in the complex, not marked. "Your Voice Your Future" continues with "War on Terror: Securing Europe"
The series “Your Voice Your Future” now seems to be trademarked syndicated series for town hall stations on news affiliates (maybe all ABC) around the country. WJLA in Washington held one this evening for its second “War on Terror” roundtable, this one “Securing Europe”. but the main website for it seems to be a station in Reno, link here. Scott Thuman reported from Brussels, the Molenbeek area, on why young men even growing up in Belgium and France are alienated. 10% of all jihadists who went to Syria come from Belgium. In Washington, Congressman Rob Wittman, Clifford May, Adbal Latif Bennett, and Zainab Chaudary, and Brooke Goldstein spoke. There was a note on Obama’s “Junior Varsity” comment, and a general agreement that the US has been completely blindsided by the development of ISIS. There was a general agree that the greatest danger in the US was lone wolf actors in low tech events. 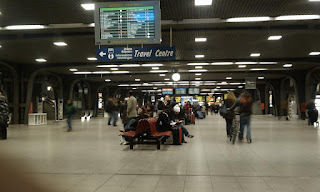 Picture: Brussels Railway station, which I visited in May 2001, having taken the Chunnel, photo by Saber 68, under Creative Commons Share-Alike 2.5. I'm hoping WJLA restores all these forums to the web (label "recorded forum events") since revamping its website. No video of this session was available yet.